At Browserling we’re building a network of online tools websites. Each site in the network focuses on one and only one tool category. Each tool does one and only one thing. The first fourteen websites in the network are Online CSV Tools, which is all about working with Comma Separated Values files, Online TSV Tools, which is all about working with Tab Separated Values files, Online JSON Tools, which is all about working with JSON data, Online XML Tools, which is all about working with XML documents, Online YAML Tools, which is all about working with YAML configs, Online STRING Tools, which is all about working with strings, Online RANDOM Tools, which is all about doing random things, Online BINARY Tools, which is all about working with binary zeros and ones, Online PNG Tools, which is all about working with PNG images, Online HEX Tools, which is all about working with hexadecimal values, Online JPG Tools, which is all about working with JPEG images, Online ASCII Tools, which is all about working with ASCII charset, Online MATH Tools, which is all about doing mathy things, Online IMAGE Tools, which is all about working with various image formats. Today we217;re releasing the fifteenth site. The fifteenth site in our network is Online UTF8 Tools. 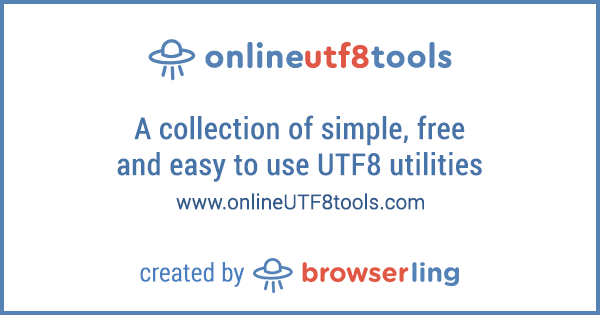 Online UTF8 Tools is a collection of simple, free and easy to use utilities for working with UTF8 encoded data. There are no ads, popups or other garbage. Just UTF8 utilities that work in your browser. Load UTF8 and instantly get result. The next few sites are onlineHASHtools, onlineTEXTtools, onlineGIFtools, onlineBMPtools, onlinePDFtools, onlineBROWSERtools, onlineCRYPTOtools, onlineAUDIOtools, onlineCSStools, onlineJStools, and then 10 more. If you like what I’m doing you can subscribe to my blog and/or follow me on twitter and/or follow browserling on twitter and/or do nothing.